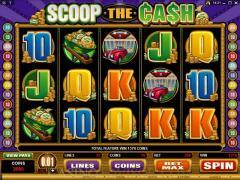 Scoops of Cash has a theme of wealth, which is extremely popular among slots players. Slots players always dream of hitting the payout that will change their lives. The symbols on the reels abound with indications of wealth. They include a Man holding cash, a Mansion with a car, a Wheelbarrow loaded with cash and a Bag filled with cash. The high value card symbols from A to 10 are also symbols on the reels. They are brightly colored and are surrounded by gold coins and cash. The scatter symbol is a Safe. The wild symbol is Scoop the Cash Logo. Though it does not depict any cash the ‘C’ is written as the symbol for cent and the ‘S’ as the symbol for dollar. The coin size range in Scoop the Cash varies from 0.01 to 0.20. Players can wager up to a maximum of 10 coins per payline. And there are 25 paylines. Each of these can be adjusted by operating the plus and minus buttons. Players can select the maximum coins of the chosen size for all paylines by clicking the Bet Max button. This also automatically sets the reels spinning. 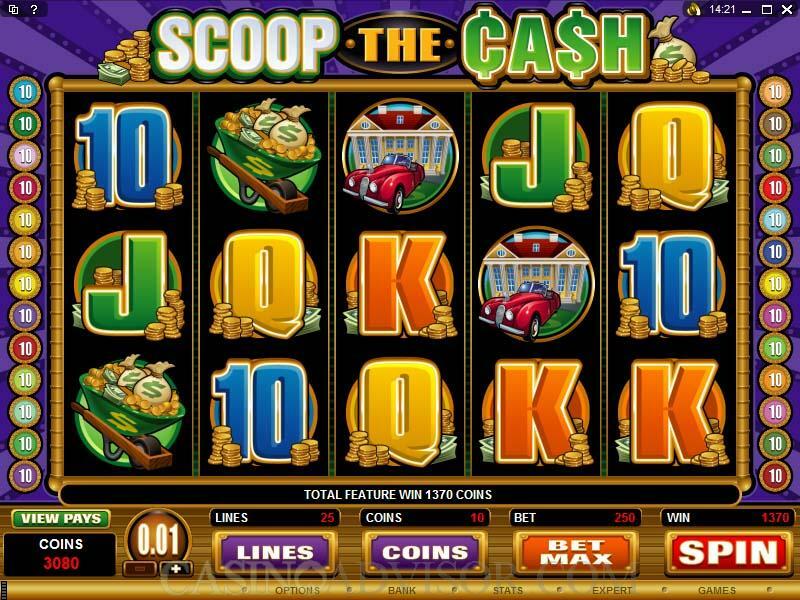 Scoop the Cash has a unique bonus feature that is different from the usual ones. It is triggered when the Dice symbol appears on reels 2, 3 and 4 simultaneously with all 25 paylines enabled. Players are awarded 2, 3 or four rolls of a set of three dice. There are three ways in which players can win in this bonus feature. Sum of each dice roll offers a payout as per the given payout table. The possible totals are classified into different sets of colors as shown on a wheel. If all the totals rolled belong to the same color then there is a payout of 20 times the total bet. The third way of winning in the Scoop the Cash bonus feature is to roll all threes of a kind. This pays out 100 times the total bet. 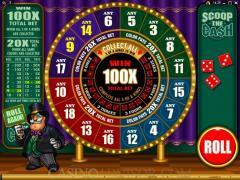 The slot game also offers a free spins bonus round. This is triggered when three scatter Safe symbols appear anywhere on the reels. Three scatter symbols offer 10 free spins and a bonus of 5 times the total bet. Four scatter symbols offer 15 free spins and a bonus of 20 times the total bet. Five scatter symbols offer 20 free spins and a bonus of 50 times the total bet. The payouts are doubled during the free spins. 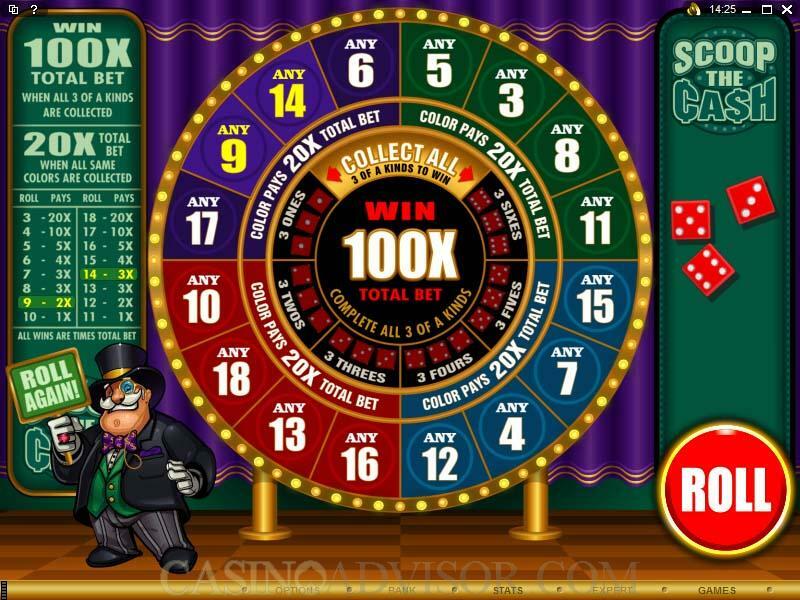 The bonus feature and additional free spins can be retriggered during the free spins. If five wild symbols appear in an enabled payline the fixed jackpot pays out 5000 coins. However, if five wild symbols appear in any position then the payout is 250 times the total bet. Interested in reading more detailed information about Scoop the Cash? If so Click Here for more details.